Kameralar hızlandı. Çok daha büyük ve detay içeren videolar çekibiliyorlar. Hızlı ve verimli kartlara ihtiyaç daha da arttı. Bağımsız hız testlerine göre şu ana kadarki en hızlı 5 SD kart. Bu testler, 4K, 8K ve yüksek bit videolarının yanı sıra hızlı fotoğraf çekimi modlarının kaydedilmesiyle yapılmıştır. Test edilen kartlarla ilgili ayrıntılı bilgiler. ProGrade Digital is a new player in memory cards, and I hadn't heard of them until being tipped off by a reader. But it has been created by a team with incredibly deep experience in the industry. They're focusing on the high end of the market with an emphasis on cards geared towards the top-shelf cameras and professional use. This was the first of their cards I tested, and it immediately jumped to the top spot and exceeded the advertised speeds in both reading and writing. ProGrade Digital doesn't have the marketing budget of the big brands, the cards come in bare-bones packaging, and the brand isn't all that well known yet, but I'm impressed with what I've seen so far. This is now the card I'm using in my primary camera. This card from Sony held the top spot in my speed tests for quite some time but has recently been pipped by the ProGrade Digital one. It's rated for 299MB/s sequential write and 300MB/s sequential read, and its speed in my tests was top rate. It comes in 32GB, 64GB, and 128GB versions. Sony also has its M-series, which are a little slower but still very good cards. Lexar have been one of the big, established players in memory cards for a long time now, but they've had some recent corporate upheaval and a change of ownership. That seemed to disrupt the production and supply of their cards for a while, and they're still not always as easy to find at retailers. With a UHS-II bus and a speed class of U3, Lexar rates this one for a read speed of up to 300 MB/s (or 2000x) but, as usual, doesn't publish a write speed other than "write speeds slower." But this card boasts impressive sequential write speed as well. It's in the Lexar Professional line and comes in 32GB, 64GB, and 128GB versions. Toshiba isn't often one of the first brands that come to mind with memory cards, but they've long been one of the best hard drive and SSD manufacturers around, so they come with very, very deep experience in flash memory. 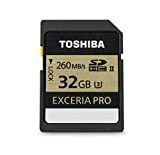 And while they've had some impressive cards in their Exceria Pro line for a while, they don't seem to have really pushed hard on the memory card direction and their cards aren't always easy to find. The SanDisk Extreme Pro badge is for SanDisk's top-of-the-line range. These are reliably solid performers from a top-notch flash memory brand. SanDisk tends to refresh their product line much more frequently than many of their competitors, but they reuse the same series names (eg. Extreme Pro). Performance is typically very consistent from model to model, so they're a very good, reliable option. It comes in 32GB, 64GB, and 128GB versions. 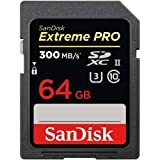 Does the Speed of SD Cards Matter? The newest cameras that are coming out have capabilities that can demand a lot from the memory card. Cameras like the new Panasonic GH5 that can record at very high bitrates, and it's becoming routine for mirrorless and even compact cameras to be able to record at bitrates of up to and over 100 Mb/s when shooting 4K and 8K video. So that the recording doesn't stop unexpectedly or you start losing footage, you'll need a memory card that can keep up with the stream of data the camera is sending to it. When memory card manufacturers advertise their cards' speeds, the first and largest number they typically use refers to the sequential read speed. That refers to how quickly data can be downloaded from the card. But when recording video or burst mode photos, what you want to look at is the sequential write speed. That's how fast you can get data on to the card. It's often not as clear as it could be; more manufacturers are starting to include it on the packaging, but it's by no means universal yet. * Sometimes there are discrepancies with the claimed speeds, where the packaging doesn't match the online specs or retailer specs. In those cases, I'm using the specs on the actual packaging when possible. In conducting these tests, my objective is to test the performance that we can realistically expect using off-the-shelf hardware. There are two things I am not trying to do. I'm not trying to replicate the manufacturers' lab tests. And I'm not trying to play gotcha and test whether the speed ratings the manufacturers claim are accurate. There are, after all, several things that can affect the speeds you can get out of cards in practice. What I am trying to do is find out which cards perform best in real-world conditions and how they compare relative to each other. Because those are the things that matter to me when I'm trying to decide which card to buy. In short, I'm looking for practical speeds, not theoretical speeds. So I'm using a real-world computer setup, not some high-end custom rig optimized to squeeze every last bit of bus transfer speed but not much good for actually processing photos and videos. There are dedicated hardware devices that exist only to test the speed of memory cards. Those are ridiculously expensive and not useful for any other purpose. Instead, I'm using readily available standard hardware that photographers might have on hand. For the reader, I'm using a Lexar Professional Workflow SR2 over USB 3.0. It's UHS-II compatible. Technically, it's not the fastest SD reader I have. That spot currently belongs to the reader that comes included with the Lexar 2000x card, but for now the only way to get that reader is to buy that card, so I don't see that as a practical, real-world option for the testing. For the software, I'm using the benchmarking suite in Digital Media Doctor by LC-Technology. All cards were new or near-new and freshly formatted. Results can vary between each test. So I'm running each set of tests three times and averaging the results. All speed ratings I'm using here are in MB/s (megabytes per second), which is not to be confused with Mb/s (megabits per second). Memory card manufacturers usually measure the speed of their cards in megabytes per second, or MB/s (or MBps, both with an uppercase "B"). But video recording bitrates are usually measured in megabits per second, or Mb/s (or Mbps, with a lowercase "b"). They're not the same thing. There are 8 bits in a byte, so to get from megabits per second to megabytes per second you multiply by 8. So 80MB/s is the same as 640Mb/s. Here's a handy conversion calculator. SDHC (Secure Digital High Capacity) is a design specification that refers to SD cards that are between 4GB and 32GB in capacity and formatted with the FAT32 filesystem. FAT32 supports individual files up to a maximum of 4GB (which is also why many cameras break up their video files into chunks that are 4GB or less). SD cards are given a speed class rating that refers to its category for writing data, with each category describing a real-world video recording use. These apply the same to SDHC and SDXC cards. The most recent types of speed class start with a U or V, as in U3 or V90. Some cards might carry both a U and V rating (and a Class 10 as well, for that matter), in which case you can focus on the higher, which would be the V rating. Where things get a little complicated, though, is that these speed ratings don't necessarily reflect the absolute speed of the card. Put another way, a card that has a V30 rating isn't necessarily faster than one that has a U3 rating. That's because to display the rating on the card, the manufacturers have to have their cards certified for that rating. It also involves revising packaging and marketing materials, which is an expensive process. So not every manufacturer will go to that trouble and expense right away. The upshot is that it's not as simply as just looking at a card with a V30 or even V60 rating and knowing that it's faster than one that only carries a U3 rating. It might be, but the rating system doesn't work quite that way. You can see evidence of that in the speed test results on this page, with some cards with a lower speed rating being faster in testing than ones that display a higher speed rating on the packaging. V90. The V-class is a new designation created for cards that are designed to work with the speeds required for 4K and 8K video. The SD Association added some lower numbers to make them backward compatible with the older class designations (e.g. Class 10 and Class 6), but the most important ones are V30 and above. Memory cards in the V90 class are rated to support a minimum sequential write speed of 90MB/sec. Their primary market is for cameras that shoot 8K video, and for now, those are pretty rare, but the class provides room to grow, as it were. V60 is applied to cards that support a minimum sequential write speed of 60MB/sec. They're aimed primarily at cameras that record 4K and 8K video. Some of the newer cameras that record with ultra-high bitrates, like the Panasonic GH5, require V60 or above. With other 4K cameras that record at lower bitrates, you might get away with a V30 card. V30 is applied to cards that support a minimum sequential write speed of 30MB/sec. These are designed to support at least full HD video and some 4K video cameras. U3 is designed to support 4K video recording at a sustained video capture rate of 30MB/s. This class overlaps with the newer V30 class. U1 is designed to support real-time broadcasts and HD video (720p and 1080p) with a minimum serial write speed of 10 MB/s. This overlaps with the newer V10 class. Class 10 is designed to support 1080p recording at a minimum (but again, not at all framerates) with a minimum serial write speed of 10 MB/s. Classes 2, 4, and 6. Class 2 supports SD video recording with a minimum serial write speed of 2MB/s. Classes 4 and 6 are designed to support from 720p and 1080p video (but not all framerates) with a minimum serial write speed of 4 MB/s and 6 MB/s respectively. Most newer cameras need cards faster than these, so memory cards in these speed classes aren't as commonly available now. For practical purposes, the most common currently are Class 10, U1, U3, V30, V60, and V90, with V60 and V90 being the current fastest classes. It is technically still possible to find older, slower cards that are Class 2, 4, or 6, but most modern cameras are likely to work better with at least Class 10 cards, especially for recording video. What is the A Rating (e.g. A1 and A2)? You might have seen an A1 and A2 ratings on some of the new cards and wondered what that is. The A1 and A2 ratings are part of a new type of speed specification that's relevant for running apps from the memory card. The A rating is a separate specification, not one in the same sequence. So it’s possible for a card to have both A1 and V30 ratings, for example. Up to this point, the primary market for memory cards has been for storing media like videos or photos. But increasingly, devices can run apps directly from a memory card. And that requires a different type of interaction with the space on the memory card--specifically, random read and write speeds and small chunks of data are placed wherever on the card there's space for them. Newer SDHC and SDXC cards have a feature called ultra high-speed bus, which refers to the interface. So far, there is UHS-I and UHS-II. UHS-I supports a maximum bus speed of 104Mb/s, while UHS-II supports up to 312MB/s. The spec for UHS-III, maxing out at 624MB/s, has been announced, but so far I've not seen any implementations of it in the wild. You can also tell them apart by looking at the cards themselves. UHS-I cards have a single row of pins on the back. UHS-II have two rows. In this example, both of these are SanDisk Extreme Pro cards, just different generations. As with many aspects of memory cards, it's not cut and dried. UHS-II (and UHS-III) allows for higher potential speeds, but in practice there's no guarantee that a a UHS-II card will be faster than a UHS-I, because there are other factors that come into play. Some cameras come with multiple memory card slots so you can choose which to use (or use both). Here are some general tips for buying and using SD cards. There are counterfeit memory cards in the marketplace, especially when you're buying online. Buying from a reputable retailer helps minimize the risk of getting a fake. SD cards are remarkably strong and rugged and are advertised as waterproof, crushproof, freezeproof, and dustproof, but they’re not completely indestructable. And losing all your photos or videos is a high price to pay for seeing just how far you can push it. They're also not designed for long-term archival storage of photos and video. It’s good practice to download the data as soon as practical and get it backed up securely. Memory cards are complicated electronic products. A small percentage of electronic products end up being faulty from the manufacturing process. So it’s good practice to test your card before using it in a mission-critical application. Better yet, have spare/s as backup. Always format the card in the camera rather than with your computer, and do it fairly regularly. This keep the memory card's filesystem set up the way the camera wants it and reduces the risk of formatting problems. It's always best practice to format memory cards in the camera you're going to use them in, but if that's not possible or not what you want to do, you can also format cards using a computer. But there are some things to know when formatting SD cards to minimize the risks of your camera having problems with them. So I've put together guides on how to format SD cards on Macand how to use the free SD Card Formatter app for Windows or Mac. HakanGunes tarafından düzenlendi. 25-03-2019, 03:47 PM.